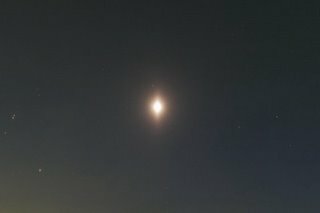 Neither sun pillar nor moon pillar is not a rare halo. But a "venus pillar" is hardly found. The photo was taken by Myao (his handle), who was searching for Comet Pojmanski. It was before dawn of Mar 4, 2006, in Tsukuba, Japan. He also observed short "star pillars"! A close-up image can be seen in his site (in Japanese). In Finnish archives we got a couple of Venus pillar observations. I think also here someone has photographed them.